Irvine Classical Players Chamber Orchestra was founded by Professor Georgette Popa to offer her outstanding violin students the opportunity to learn and perform the chamber music repertoire. The mission of the Irvine Classical Players Orchestra is to provide each of its members with the unique opportunity to perform as soloists in an orchestral setting. In an attempt to assume the highest level of musicianship and performance while the students are members of the orchestra, they have the chance to participate in sectionals and master classes with world-renowned soloists and pedagogues. The ensemble includes students from a number of the finest private music studios in Southern California. Founded in 2003, the orchestra's first concert tour in the Summer of 2004 included concerts in the Brittany and Normandy regions of France at such historic places as L'Abbeye de Lehon, the Fortress City of Saint Malo and Peace Memorial in Caen. The highlight of the French Concert Tour was the concert at the Mont Saint Michel Benedictine Abbey founded in 1021. 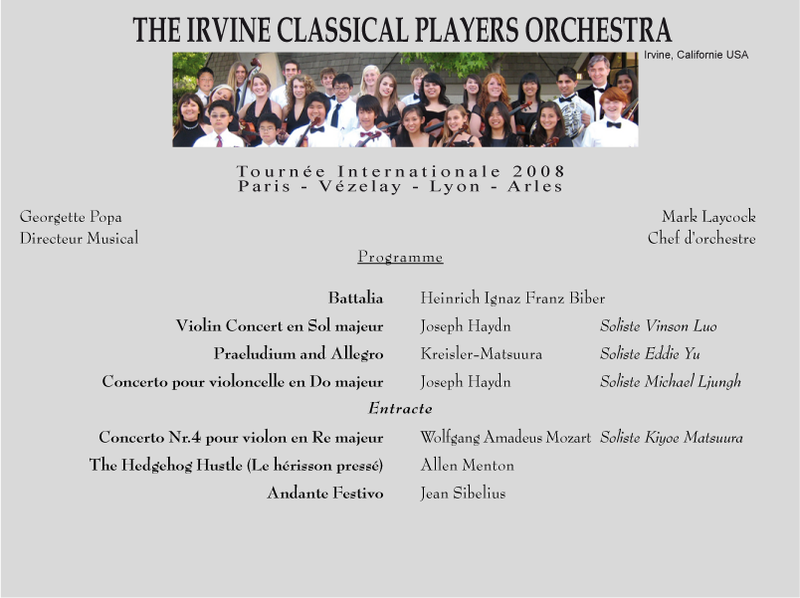 Subsequently in 2006 the Irvine Classical Players was invited to perform in the International Summer Music Festival in Florence, Italy. The Italy Concert Tour included performances at the Chiesa del Redentore in Venice, Chiesa San Francesco in Trevi and the beautiful Chiesa Valdese in Rome. The Irvine Classical players are pleased to announce their third International Concert Tour to France, which will include concerts in Paris, Vezelay, Lyon and Arles. The repertoire for the upcoming France Concert Tour includes: Wolfgang Amadeus Mozart: Violin Concerto No.4,Haydn Cello Concerto in C Major, Haydn Violin concerto in G major, Preludium and Allegro for violin by Kreisler-Matsuura, Battalia by Biber, Andante Festivo by J. Sibelius, and an orchestral piece composed specially for Irvine Classical Players, The Hedeghog Hustle, composed by Alan Menton. The average age of the young musicians of the Irvine Classical Players is 14 and the membership reflects the rich cultural diversity of Southern California.